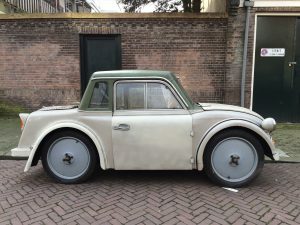 The Hague, the Netherlands / Bern, Switzerland – Unique crowdfunding project aims to restore the original «Volkswagen» developed by Jewish engineer Josef Ganz and presented before Adolf Hitler at the 1933 Berlin motor show. Fast forward five years: Hitler introduces the Volkswagen to the German people while the Nazis deliberately erased Josef Ganz from the pages of history. This project is initiated by Paul Schilperoord from the Netherlands, writer of the book The Extraordinary Life of Josef Ganz – The Jewish Engineer Behind Hitler’s Volkswagen, and Lorenz Schmid, a Swiss-born relative of Josef Ganz. 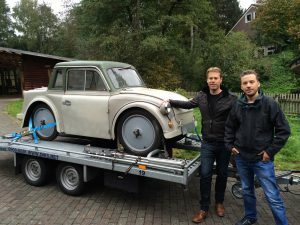 Together, we secured the only surviving rolling chassis of Josef Ganz’s «Volkswagen»: the Standard Superior type I. An estimated number of around 250 cars were built in April to September 1933. 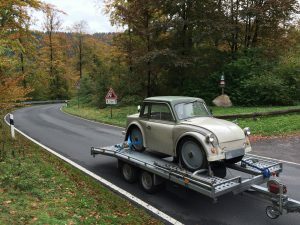 Our car survived as it was kept on the road in East Germany for decades, but the bodywork has been largely modified using Trabant parts. 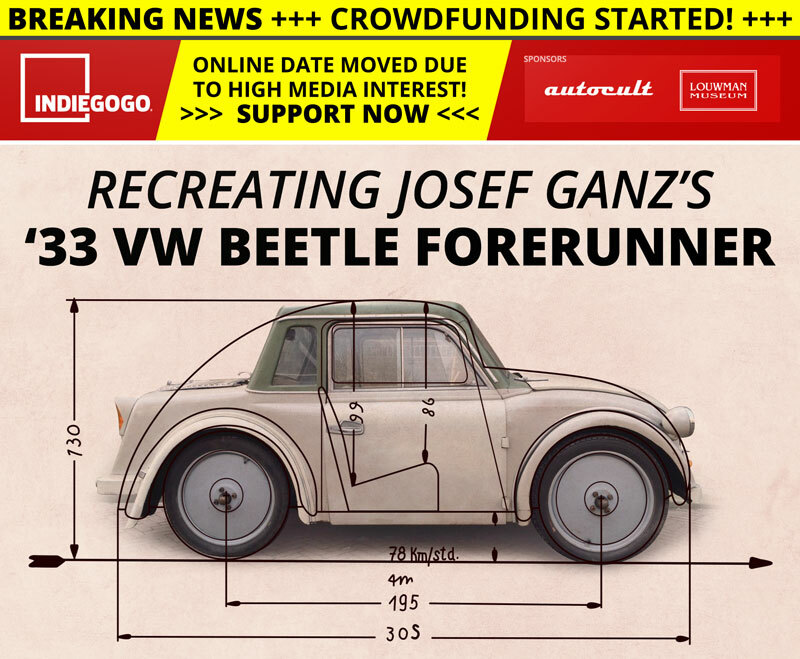 Working with professional restorers, we want to recreate the original wooden bodywork of this car – and use the car to promote the work of the forgotten genius Josef Ganz. We aim to unveil the finished car in 2018 during a special event at the prestigious Louwman Museum in The Hague, the Netherlands. The Standard Superior is the embodiment of Josef Ganz‘s propaganda campaign «For the German Volkswagen». As editor-in-chief of Motor-Kritik magazine, in the period 1928-1933, he outlined the specifications for this future car: low-slung, streamlined, backbone chassis, rear-mounted engine, fully independent suspension with swing axles and a price not exceeding 1,000 Reichsmark. 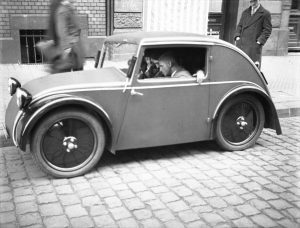 His vision first materialized in his 1931 Maikäfer (May Bug) prototype. 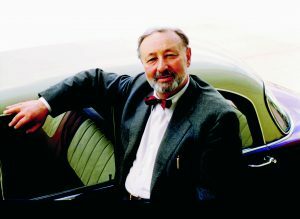 Josef Ganz inspired the industry to develop radical new prototypes – including the Zündapp Type 12 and NSU Type 32 «Volksauto» prototypes by Ferdinand Porsche. 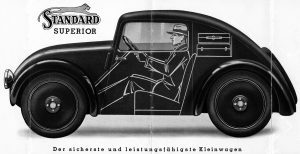 At the time of its introduction at the Berlin motor show in 1933, the Standard Superior was the only 4-wheeled, rear-engined production car in Germany. It even inspired Hitler to realize the ultimate Volkswagen for the German people, developed by Porsche. Sadly, Ganz was nearly assassinated and erased from history. Biography The Extraordinary Life of Josef Ganz – The Jewish Engineer Behind Hitler’s Volkswagen signed by author Paul Schilperoord. Photos in high resolution are available for download via Dropbox. Lorenz Schmid in Switzerland, [email protected], M + 41 (0)79 5960096. Paul Schilperoord (left) and Lorenz Schmid (right) with the Standard Superior type I project car. The Standard Superior type I project car. 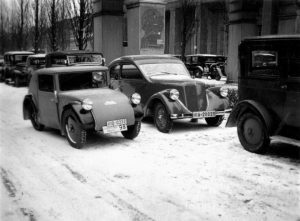 The original Standard Superior type I (left) next to the Zündapp Type 12 prototype (right) by Ferdinand Porsche, Berlin, 1933. The original Standard Superior type I, Germany, 1933. Original brochure for the Standard Superior type I, Germany, 1933. 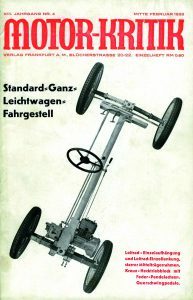 Cover of Motor-Kritik showing the chassis oft he Standard Superior, Germany, 1933. 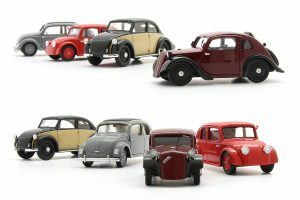 Set of 1:43 scale models by AutoCult, including the Mercedes-Benz 120 (W17), NSU Type 32, Standard Superior type II and Tatra V570.